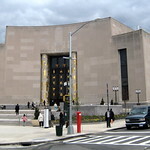 Right across from Prospect Park and home to the famous Soldier's and Sailor's Arch, the Brooklyn Central Public Library is the largest library in Brooklyn. Learn a new language at the Multilingual Center. Use our Articles & Databases to conduct research. Learn about Brooklyn's rich history at the Brooklyn Collection. Get all the information you need to start your own enterprise at the Business Library. Attend an author reading, poetry discussion or other public program offered throughout the year." Please call or check the library's website to learn about all of their free services and events!